I don’t know about you, but when I make a recipe for meat that is juicy, fast and delicious fresh and even better leftover, it is a keeper! These thighs are so yummy and have a bit of a umami addiction to them. The ingredients are SCD, Low FodMap and Paleo and Gluten Free. I love to chop up the leftover chicken the next day and add to a salad for lunch. I also pack them cold for my girls’ school lunches the next day, and they love them that way. Since Chili Powder has garlic added, I found Chipotle powder a fantastic option. Make sure your spices are gluten free and organic is even better. I love Spicely Organic Spices since they are certified gluten free, and I am very sensitive to gluten. Here is the recipe. Let me know what you think. 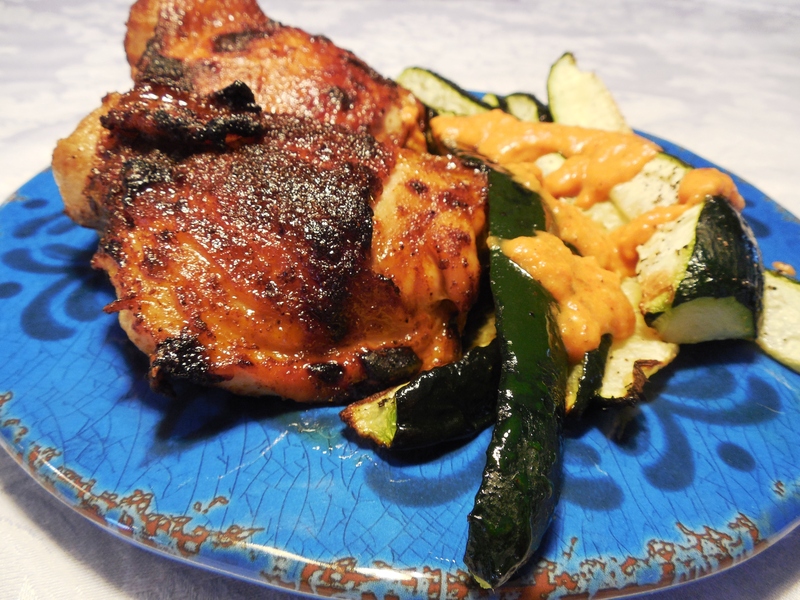 I served the thighs with oven roasted zucchini spears drizzled with Roasted Red Pepper Sauce (recipe coming soon), and a salad. 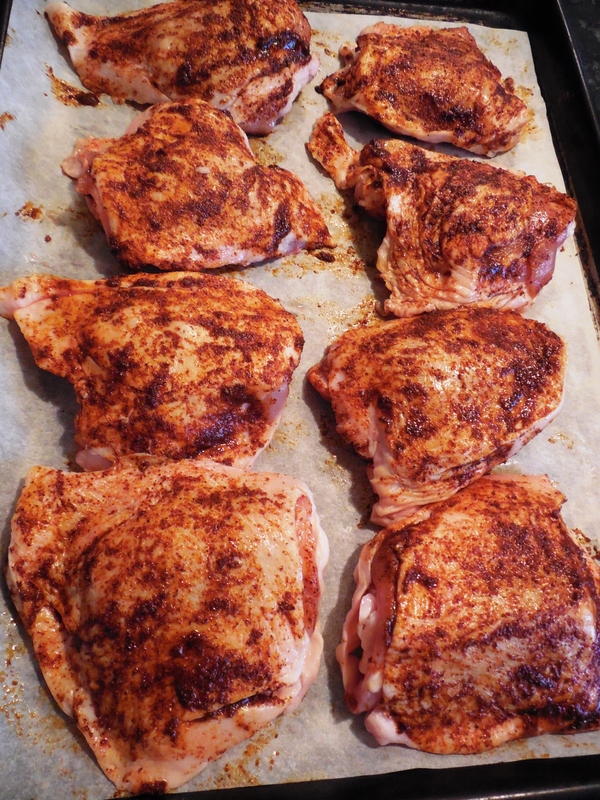 Lay your chicken thighs out on a parchement covered rimmed baking sheet. Mix together garlic oil through cayenne and stir to create a rub. Rub evenly all over both sides of the thighs. Mix together 6 tablespoons of clear honey and 1 tablespoon cider vinegar to brush on at the end and set aside. Broil chicken 7 minutes, then turn all the thighs over and broil for 7 minutes more. Take thighs out of oven and brush with half of the honey/vinegar mixture and return to broiler for 2 minutes, turn once more and brush with remaining honey/vinegar and broil 2 more minutes or until 165 degrees in the center. That is 18 minutes and they are done! So Juicy, Fast and Delicious! Ming, Ming is a typical Pug. She loves her food! I feed her a very nutrient dense, clean, meat based diet. She also loves fruit as occasional treats and carrots. She is my Paleo Pug. She is two years old, and when my husband gave her to me for Christmas when she was a puppy, she fit in the palm of my hand. I am her person. It is humbling and infinitely wonderful to be loved with such devotion by Ming. I want her to live a long, long life and be healthy as she ages. She loves chicken, and when you say “chicken” her eyes get very large and she tilts her head to the side listening intently. It is a buzz word for her as well as “liver”. When I have a crock pot of chicken bone broth going in the house she hangs around the pot just to smell it. Pugs have a tendency to the plump side, so she walks every day with me and we keep her treats small. In this photo, Ming is waiting patiently, but seriously, for her dinner. Lately I have been craving lamb. I think my body may need more zinc and selenium. You can get both in lamb. Here is a new recipe from Diane Sanfilippo, of Balanced Bites and Author of Practical Paleo and The 21 Day Sugar Detox books using ground lamb. I love Diane’s Easy and Nourishing recipes. They get my family fed and me out of the kitchen to play! Go here to get the recipe and see photos of the meatballs. Easy Recipe: Meatballs with Tangy Cilantro-Chive Sauce. Make, enjoy, and get outside to enjoy Spring! Won’t Miss a Thing Ranch Dressing! Won’t Miss A Thing Ranch! Garlic Infused Oil and Chives makes this dressing Rock! Garlic is a FodMap and not allowed on a low FodMap diet, but garlic Infused oil is allowed, and it is a fantastic replacement. I buy my oil from Fustini’s Oils online. You can find it at local oil and vinegar shops. The dressing is creamy, thick and tangy. My daughters (age 11 and 13) prefer it over any store bought versions. So here it is, I hope you love it! Let me know! Add all the ingredients into a bowl, whisk until fully incorporated and enjoy! Mmmmm! So good! My name is Sam, and I am starting a blog to record all the yummy things that can be created even though you might be on a restricted diet. I have been eating a Paleo diet for a year and a half and now need to tweak it into a SCD/Low FodMap lifestyle. I was diagnosed with SIBO (Small Intestinal Bacterial Overgrowth) recently after years of digestive problems. I am working with my doctor and a registered dietitian to heal, and still need and want to make and eat delicious food…..I am a foodie….. and will be preparing food that doesn’t make me or my family feel like they are missing anything. My goal is to create recipes that get me out of the kitchen and enjoying my friends, family, parties, nourish, heal and make me glow with health and still have people tell me what a fantastic cook I am! Stay tuned, I am here to help us! 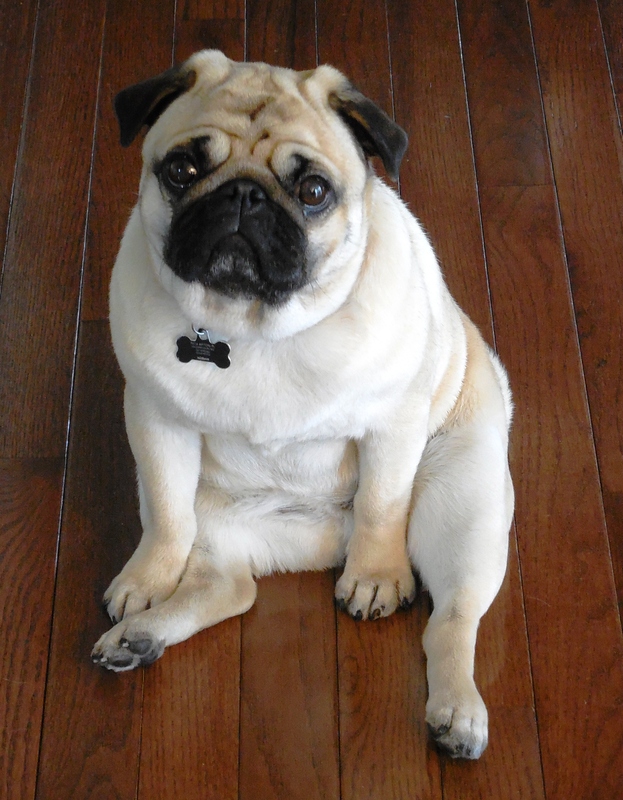 I also have a quirky pug named, Ming Ming, whom I love to share stories about.